The fifth floor Student Center reading room, basically unchanged since its inception in 1965, may soon undergo new construction. Talk about reaching for the stars. After having its charter revoked earlier this year, fraternity Sigma Phi Epsilon has returned to campus and is recruiting members. 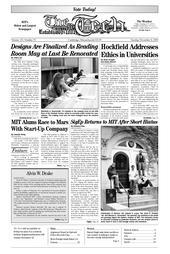 The national headquarters had revoked the MIT chapter’s charter in January 2005 because of its lack of members and decreasing size. Alvin W. Drake, a professor emeritus of electrical engineering and computer science who was respected among colleagues and students alike for the vitality of his teaching and the vigor of his research, died of cancer at a hospice near his Falmouth home on Sunday, Oct. 30. He was 70. Harvard’s student newspaper The Crimson and Harvard University argued before the Massachusetts Supreme Judicial Court yesterday in a case that could require the disclosure of arrest records by private university police departments. The number of international students entering American graduate schools rose 1 percent this year, despite a 5 percent drop in applications from foreign students, according to the annual report by the Council of Graduate Schools. In the Parlance of Our TimeTo the Infinite, and Beyond!